Black-footed albatross have a wingspan in excess of seven feet. Measuring from wingtip to wingtip, that’s about as wide as the NBA’s Yao Ming is tall. Let that sink in. Many other Black-footed albatross feats of nature mirror those of Laysan albatross—their long-distance flying, their devotion to chicks, and their general all-around amazing-ness. But they do have a few differences to Laysan albatross. Most noticeable, besides their color, is their walk. Oh, that walk! I’d forgotten their exaggerated walk. But last week, I got lucky and sighted a Black-footed albatross for the second week in a row. What’s more, it landed 30 feet from me. Once it settled itself with a good overall body shake, it lowered its head and started walking right for me. Good thing I had my camera in hand. I often use the super telephoto lens on my camera to take a quick snap of the bands on the legs of Laysan albatross. I find it a better alternative to binoculars. I can zoom in on my camera’s LCD and read the band number without having to get as close to the bird as I do with binoculars. I’d been capturing “re-sights” of Laysan albatross when the Black-footed albatross swung in for a landing. I’m surprised I held my excitement at bay long enough to remember to capture the moment in pictures. But I did, and now, I have a couple images to add to Albatography, one of which is the Black-footed albatross walking right for me, its head lowered in what some might think a ominous position. For me, this pictures makes me smile every time. After spending a little time with Black-footed albatross at Midway a few years back, I noticed some other differences, as well. First, they tend to be crankier than Laysan albatross. Too, when it comes time for breeding season, they arrive back a week or two before Laysans. Their courtship dance is definitely speedier and more vigorous with their moves performed more simultaneously rather than alternately as in Laysan albatross. They both perform the bill tuck under the scapulars (“armpits”), but Black-footed albatross will flare both their wings rather than just one. Two other things about Black-footed albatross: 1) Their abundance; and 2) Their nesting locations. Black-footed albatross are less abundant than Laysans by a margin of 3:1. Whereas the population of Laysan albatross is estimated to be three-quarters of a million individuals; Black-footed albatross number around 250,000. Like I shared in my last blog post, they also tend to nest on the edges of very flat islands and islets and atolls in the Northwestern Hawaiian Islands in the protected marine area Papahānamokuākea Marine National Monument. With sea level rise, their future is tenuous as they lose breeding habitat. Instead of waiting until the species is on the brink of extinction to do something about their survival, Pacific Rim Conservation and the U.S. Fish and Wildlife Service, Papahānamokuākea Marine National Monument, and the State of Hawaii Department of Land and Natural Resources have partnered to start a new breeding colony on the high-elevation island of Oahu. That’s where Pacific Rim Conservation comes in. 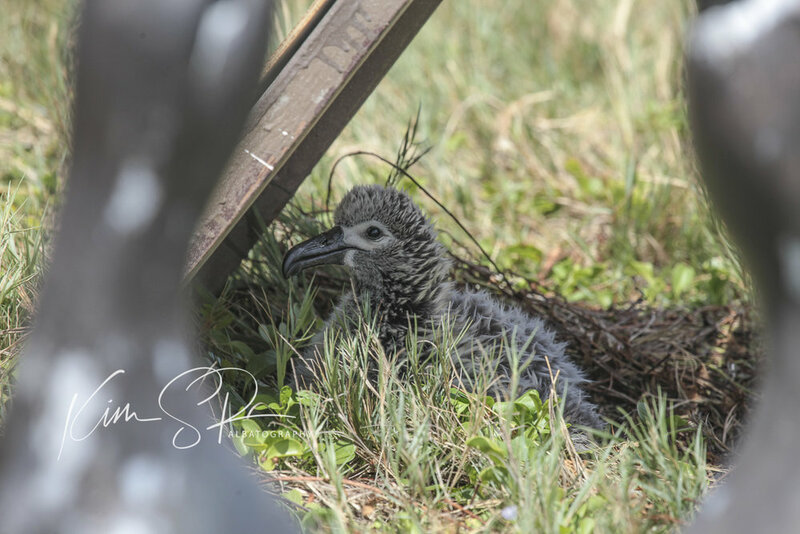 They’re raising this year’s cohort of chicks that were rescued from nest sites liable to being swept away by the sea at two locations in the Papahānamokuākea Marine National Monument. Here are a few more images of Black-footed albatross. 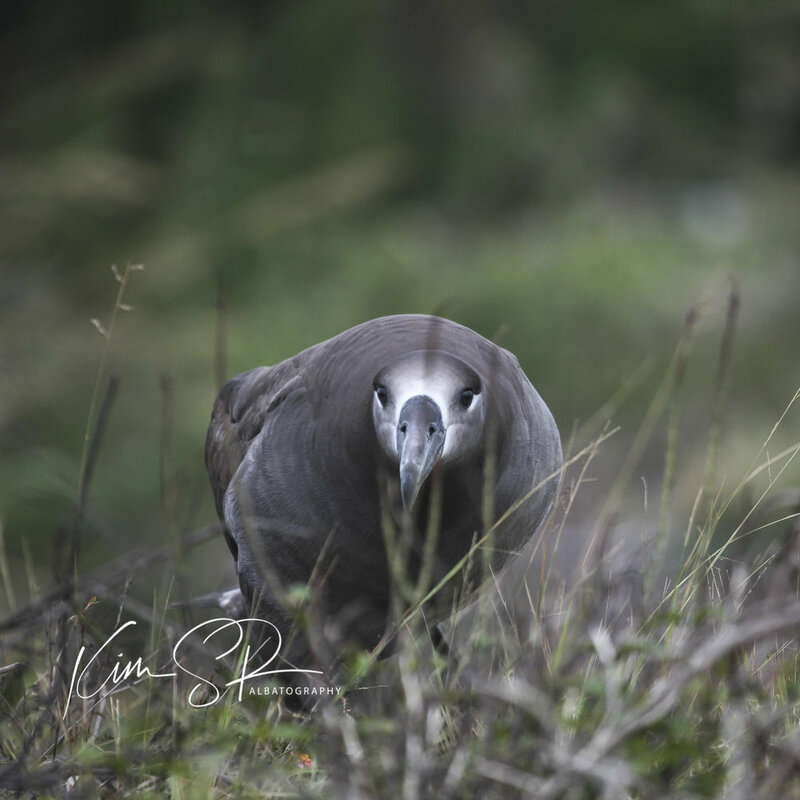 These were taken years ago at Midway Atoll National Wildlife Refuge with old camera gear, and their quality precludes me from adding them to the website for sale.